The Bemidji State University men’s ice hockey team (12-12-3; 10-8-1-0 WCHA) finishes their series in Sault Ste. Marie, Michigan this weekend, renewing a rivalry with the Lakers. 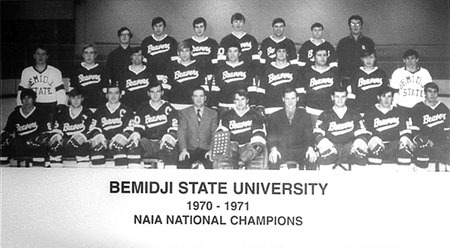 BSU and LSSU met in the late ’60’s for a couple of National Titles. The Beavers lost Friday night 5-2, with Nick Cardelli and Owen Sillinger scoring. Ohio listening tonight. lets go men and get on the track for a victory tonight. What roads do you travel to get to LSSU. Uncle Stork listening in from the car on my way to pick up the leader of the Tommy Muck fan club (his Dad) in Baltimore and head back to DC to see what kind of trouble we can get into for a few days out here!